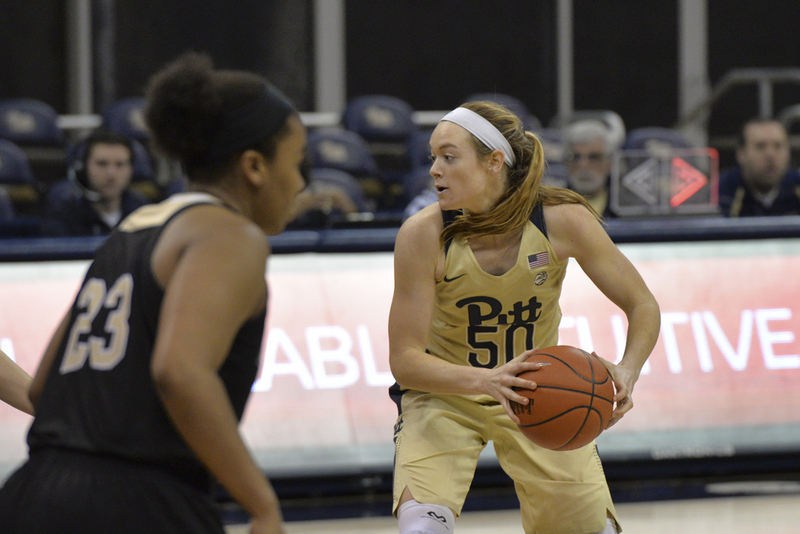 The Pitt women’s basketball team won a decisive 76-60 contest against the Bryant Bulldogs on Tuesday night, scoring a staggering 28 points off turnovers in the game. The Panthers (7-2) defense proved to be too much for the Bulldogs (4-4) as Bryant turned the ball over 25 times during the non-conference home game. But Pitt’s 24 fouls made the performance less than perfect in the eyes of Pitt head coach Suzie McConnell-Serio. First-year guard Jasmine Whitney led the Panthers early, scoring the team’s first six points on a pair of layups and a jump shot, but Bryant took an early 8-6 lead after a free throw by center Morgan Olander. With just under five minutes remaining in the first quarter, the Panthers cut the deficit to one after a shot by guard Aysia Bugg. Less than a minute later, Pitt took an 11-10 lead on a layup by forward Kalista Walters. The Bulldogs turned the ball over seven times in the first quarter, but Pitt allowed them to stay competitive and led by just one point after the opening 10 minutes of play. Bryant scored four straight points to open the second quarter and took a 19-16 lead. The Panthers responded quickly, going on a 7-0 run behind five points from leading scorer Brenna Wise. Fouls became a problem for Pitt in the latter part of the second quarter, as Bryant was in the bonus with over four minutes left. Regardless, the Panthers kept stretching the lead due to the Bulldogs’ poor shooting. Pitt took a 30-23 lead on a three-point play by Wise with 3:55 to go, but Bryant kept the score close, making the last four points of the half and going into the locker room down 32-27. The Panthers’ defense was the difference in the first half, as the Bulldogs turned the ball over 15 times in the first half. Pitt scored 15 points off those turnovers, resulting in their five-point lead. Determined to begin the second half aggressively, Pitt forced turnovers on each of Bryant’s first three possessions. The Panthers capitalized, going on a 6-0 run — including four points off turnovers. The Panthers took their double-digit lead of the game on a layup by Bugg with 6:30 to go in the quarter. Soon after, Wise added to the lead, forcing a turnover and making a transition layup to put Pitt up 44-31. The Bulldogs were able to keep the game within reach to end the third quarter, as forward Alex Klein made eight consecutive free throws. Going into the fourth quarter, Pitt held a 52-43 advantage. Klein continued to cause the Panthers issues, getting to the foul line twice to start the quarter. She converted three of the four shots, cutting the Panthers’ lead to 52-46. Pitt responded, taking a 61-48 lead with 5:43 to go after a three-pointer by Whitney, forcing the Bulldogs to take a timeout. The Panthers’ offense continued to have success against the Bulldogs’ defense coming out of the timeout, putting the game away. Pitt went on to win 76-60. Wise was again the star for the Panthers, achieving a double-double late in the game and finishing with a season-high 23 points and 10 rebounds. Wise gave her teammates credit for her performance. The Panthers now travel east to play in-state rival Penn State in their first road game of the season. The game tips off at 2:00 p.m. on Saturday, Dec. 10.